The chair and the table take little room to store as they fold flat. Table (length 55 cm, width 54 cm, height 70 cm). 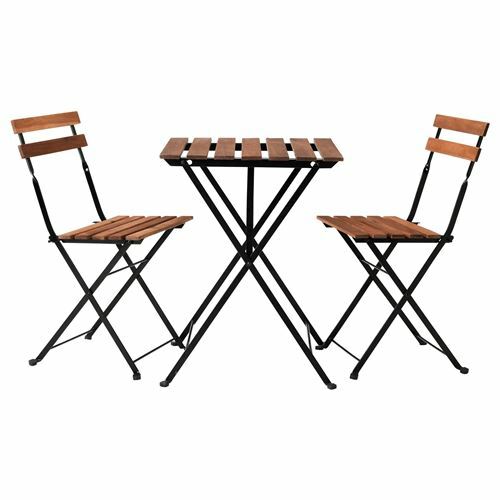 Chair (width 39 cm, depth 40 cm, height 79 cm, seat width 39 cm, seat depth 28 cm, seat height 45 cm). May be completed with FRÖSÖN/DUVHOLMEN, YTTERÖN or STEGÖN chair cushion or BENÖ chair pad (dia. 35 cm). May be completed with TOSTERÖ cover for furniture set 100x70 cm. Chair, outdoor/table, outdoor:Renewable material (wood).